As one of top parks in the Six Flags chain, Six Flags Great America has come into its own to become one of a kind. With a reputation of fun and thrills before Six Flags moved in, the years gone by have brought more thrills than anyone would know. Opening in May of 1976 as the United States of America itself was celebrating its bicentennial. Marriott's Great America originally opened with only two coasters, but as with the USA, this would quickly change. As the years went by, Great America continued to bring new and exciting rides to the park. Great America grew into something more than what they could ever dream of--A park of many firsts in the world of roller coasters. The team of Bolliger & Mabillard found a place that they could unleash their new steel creations. Iron Wolf was the team's first coaster. Batman: The Ride became the world's first inverted coaster, and Raging Bull was the first hyper twister coaster to be found in the United States. With the addition of Superman Ultimate Flight, Great America had an amazing collection of four B&M coasters. Iron Wolf eventually left, but was quickly replaced by X-Flight. 1997 saw the opening of the Southwest territory. The first brand new section to park since it's opening in 1976. Step into the Wild West with two coasters, and three flats rides. This showed that the west could be still be fun even in the Mid West. Hurricane Harbor was another new section that opened in 2005 with a big splash. No pun intended. Hurricane Harbor is a full-fledged water park that one can spend the whole day soaking up the sun, or split the day in half between the wet and dry park. With it being such a huge hit, Hurricane Harbor received another huge expansion in 2011. The history of the USA is quite elaborate, as is the history of Six Flags Great America. You just have to jump into their world and breath it all in. 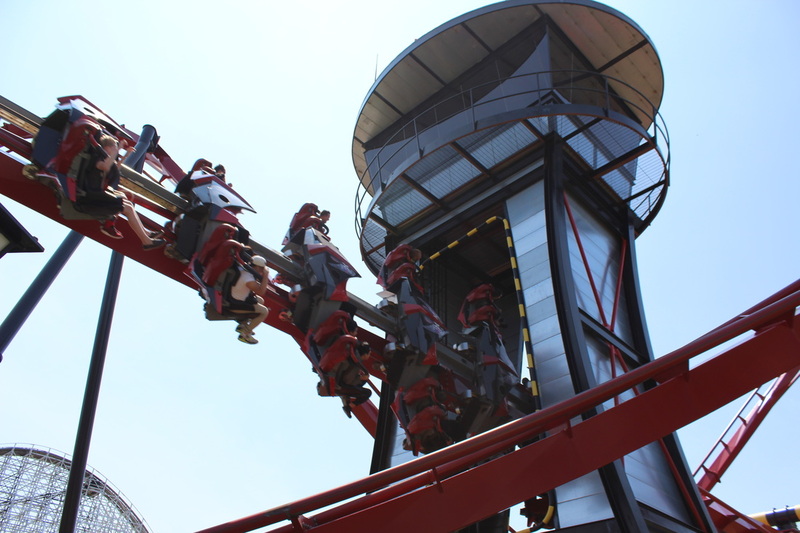 With rides for the little kids, and thrills rides for teens and adults this park makes for a great day. This tradition was continued in 2014 with the addition of Goliath, a wooden work of art that broke three world records. Goliath was built by Rocky Mountain Construction, same company responsible a new breed of wooden coasters like The NEW Texas Giant, Outlaw Run, Iron Rattler, and Steel Medusa, that is not only going to change this park, but any other park that decides to put one of these coasters into their line up. No matter if you say Marriott's Great America, Six Flags Great America, or Great America, one thing is the same, fun. You must know that this park is more than just rides, shops, and games, but also memories that you'll have for a lifetime. With your last look as you leave the gates, you'll know you had a Great American day. Can you feel a brand new day?